Well-organized for situation-to-situation perusal, this guide to childhood safety blends tried-and-true methods with contemporary content. We’re advised to listen to our elders for a good reason: they have more experience than us, and a wealth of wisdom to impart. 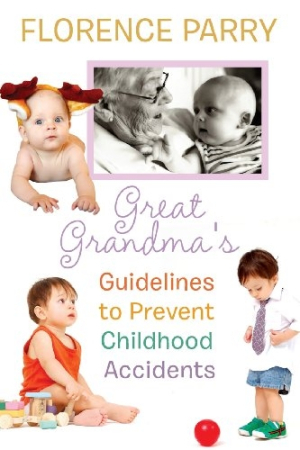 Florence Parry, the “Great Grandma” of Great Grandma’s Guidelines to Prevent Childhood Accidents, has personal and extensive professional experience educating parents about common childhood accidents and how to avoid them. Parry collects her knowledge in this thoroughly illustrated, common sense safety manual that addresses preventable accidents and injuries from birth to age fifteen. Parry has seen every type of childhood accident, from skinned knees to drowning, in her years as executive officer of the Home Safety Division of the National Safety Council of Western Australia. She addresses possible accidents in separate chapters, each devoted to a particular type of danger, including choking, falls, burns, and poisonings. Drawings and photographs—many marked with an X for “no” or a checkmark for “yes”—illustrate her points clearly, although some pages feel cluttered with pictures that interrupt the flow of the text. The illustrations vary in style from quaint drawings to modern photographs. This combination of old-fashioned and contemporary appears throughout the book. Parry offers more examples from her years with the safety council from 1974 to 1990 than she does from more recent years, although up-to-date references assure her advice also follows the most current recommendations. Parry writes nostalgically about childhood in the 1930s, for instance—when it was perfectly safe for children to play in the streets—but follows up with modern-day safety-restraint rules. Some of Parry’s advice is specific to Australia, such as extensive coverage of bush fire prevention, the inclusion of local emergency telephone numbers, and an illustrated list of poisonous spiders. Other sections offer more universal information about playground safety, fire-retardant clothing, and sports injuries. Her tone is straightforward and instructive throughout, and she includes practical tools, like a first aid kit checklist and a list of common household plants with poisonous properties. Newspaper clippings that report tragic accidents, like a three-year-old who fell off a balcony when left home alone, reinforce Parry’s pleas for parents to follow her advice. Great Grandma’s Guide to Prevent Childhood Accidents can be a little overwhelming to read all at once, leaving one wondering what activities remain safe enough for children. On the other hand, Parry has organized the book so it’s easy to read only the chapter families are most interested in at a given time. The chapter headings make this division fairly clear, although an index would encourage even more use as a reference book for parents to dip into when they have questions. For parents who have found useful advice in Heidi Murkoff and Sharon Mazel’s What to Expect When You’re Expecting or the American Academy of Pediatrics’ Caring for Your Baby and Young Child, Parry’s book is a natural addition to their bookshelves.